Looking for a fun, yet easy, fall dessert? Look no further! 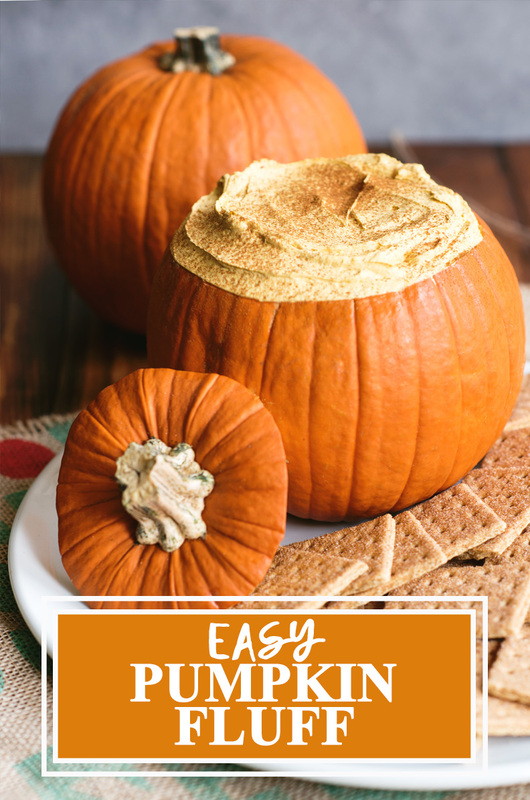 This amazingly simple recipe known as Pumpkin Fluff is perfect for all of your fall festivities. 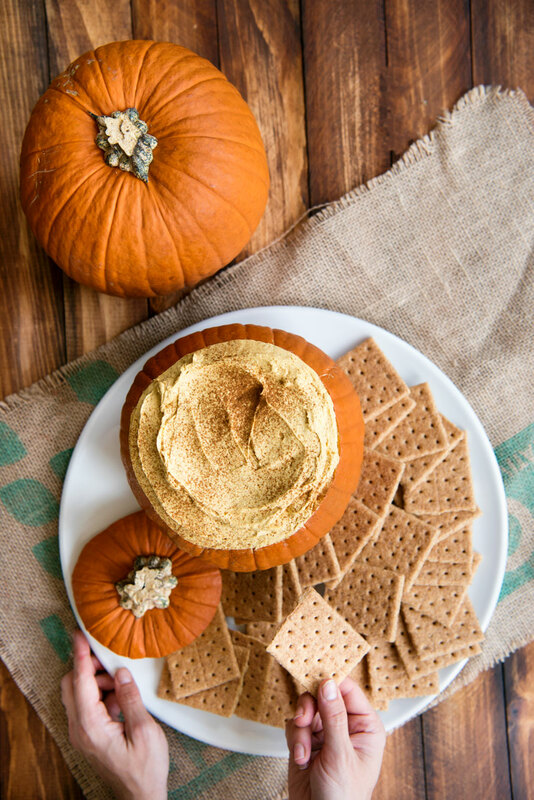 This amazing pumpkin dip recipe is a staple at my family’s annual Halloween get-together. Pumpkin Fluff is exactly what it sounds like … a light and fluffy, sweet dessert! It’s always a hit at the party. People are always asking for the recipe and the pumpkin I serve it in is scraped clean by the end of the night. What is a Pumpkin Fluff? Before getting started on putting together the ingredients and following a recipe, why not take a moment to learn about the pumpkin fluff? What started the trend? Who created the first rendition of this fluff? It is tough to say when exactly the pumpkin fluff recipe floated around, since everyone has their own version and contributed to the recipe over the years. After some investigative research, we can say this much. Pumpkin fluff recipes have been around for at least 10 years or more. That’s around the time smartphones started becoming widely owned in households and lifestyle blogs experienced a boom in popularity! So, what exactly defines that which is the “pumpkin fluff”? In short, it is a fluffy dip served inside a pumpkin. Sounds simple. Maybe a bit too simple. And that’s exactly the appeal! There are many desserts that are part of the fall season, but not all of them are easy to replicate. Pumpkin pies and apple tarts are commonplace and require some level of cooking expertise in order to be deemed delicacies worthy of the dinner table. For hosts who want to provide a fun treat without struggling through complicated baking steps, the pumpkin fluff can be the answer! Since we examined a bit of background on the pumpkin fluff, why not have some more fun digging into why the pumpkin became a staple for the Halloween season? It is common knowledge that Halloween originally started as the Irish festival called “Samhain” to mark the changing of seasons from summer harvest to the upcoming winter. What many may not realize is that pumpkins did not have any part to do with this tradition. It was not until the arrival of Irish and Scottish immigrants in the mid-1800s that Halloween became popular in the Americas. Since pumpkins are native to North America, the increase in groups celebrating Halloween gradually led to jack o’ lanterns being carved and lit at night. From then to the 1930s, Halloween evolved to include costume parties and trick or treating. By then, pumpkin carvings had generations of time to become a home tradition. Sometime in the 1960s, a farmer named John Howden developed what is the most widely recognized carving pumpkin today (source). It is thanks to these continuous developments in the Halloween holiday and pumpkin agriculture that brought us to being able to share creative recipes in modern times! Just take a look at the finished pumpkin fluff below. So cute, right? I think cinnamon graham crackers work best with the dip, but other options such as Nilla Wafers or shortbread are also delicious alternatives. Even if you have no time for cooking or little experience in the kitchen, you can still make this recipe easily! Just stir all of the ingredients together and you’re done. No baking, chopping, prepping or fancy appliances needed. 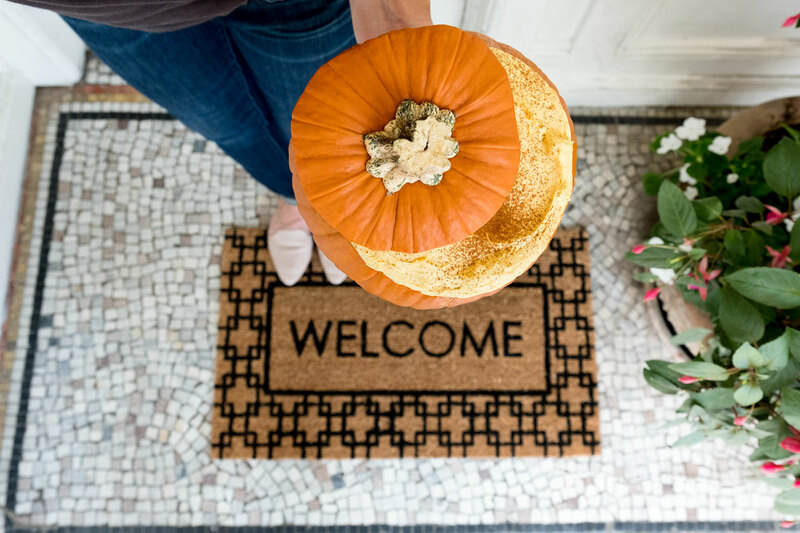 Take advantage of the Fall/Halloween season and instead of placing the dip in a serving bowl, carve out a small, table-sized pumpkin and place the refrigerated dip inside the cleaned out pumpkin. This Halloween recipe is sure to be a crowd-pleaser at your party this year too! Mix pumpkin, dry pudding mix and spices in large bowl with whisk until blended. Stir in Cool Whip. Refrigerate 1 hour. Recipe notes: If you’re looking for a lighter version, have no fear! 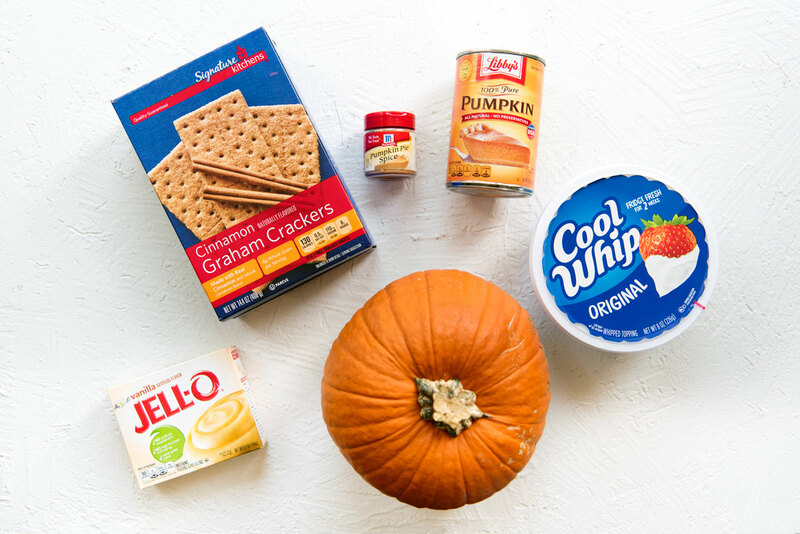 The same wonderful taste of Pumpkin Fluff can be made healthier by replacing your regular vanilla pudding with the sugar-free choice and use fat-free Cool Whip instead of the regular whipped topping. Same great taste – fewer calories! See how simple that was? What’s your favorite spooky dessert? 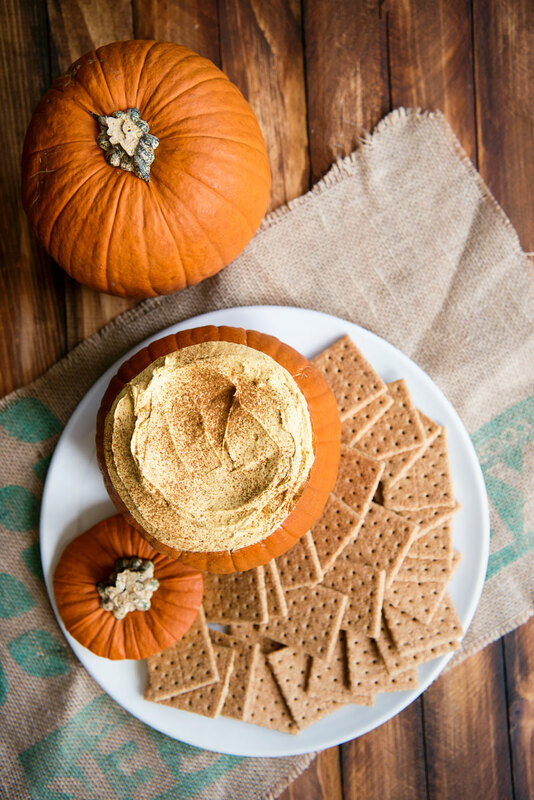 While your guests would enjoy the pumpkin fluff with their favorite crackers or wafers, you can preemptively set the mood for the party from the front door! You can choose from a catalog of doormats available from Mohawk Home to find the mat that will fit your home and evoke an inviting atmosphere for anyone who comes over. Give your party guests a warm welcome with a festive coir doormat from Mohawk Home, like the one pictured. Click here to shop the look! Kelly Huibregtse is a San Francisco-based food & travel photographer and recipe developer. Food is truly her love language. You can see more of her work and original recipes at A Side of Sweet. It’s awesome with butterscotch pudding and ginger snaps or make a trifle with ginger bread!! This was great! I added all 12 oz. of whipped topping which made it just right. Not too sweet or heavy. Yes! So glad you enjoyed it.